The name of Henri Dutilleux is associated above all with orchestral music. His international reputation originated with the Second Sym­pho­ny, ‘Le Double’ (premièred in 1959) and was confirmed by works such as Métaboles and the cello concerto Tout un monde lointain… But what about before that? In the centennial year of the composer's birth, the Orchestre National des Pays de la Loire and Pascal Rophé present a programme which focusses on works composed before 1954, and offers the opportunity to discover a less familiar but by no means negligible side of Dutilleux's creative activity: songs and music for the theatre and film. Several of the works on this disc are recorded for the first time in these versions, or indeed at all. Performed by the French baritone Vincent Le Texier, Éloignez-vous – one of the Cassou settings – and Quatre Mélodies appear for the first time on disc in the version for orchestra. 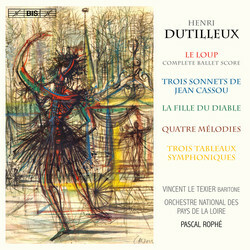 The complete score of the ballet Le Loup only exists in a recording made in 1954, while the Trois Tableaux sympho­niques – originally composed as incidental music for a stage adaptation of Wuthering Heights – and the extracts from the film score La Fille du Diable are here made available on CD for the first time.